More than 150 Invokana lawsuits accuse Johnson & Johnson of failing to warn patients about serious side effects allegedly associated with the Type 2 diabetes medication. (PRLEAP.COM) April 27, 2016 - Invokana lawsuits (http://www.rxinjuryhelp.com/invokana/ketoacidosis/) continue to be filed in courts around the U.S. on behalf of patients who allegedly suffered diabetic ketoacidosis or kidney damage due to their use of the Type 2 diabetes medication. According to a report published by The Legal Intelligencer on April 25th, more than 150 cases have been filed in federal and state courts, including at least 15 that are pending in Pennsylvania's Philadelphia Court of Common Pleas. Dozens have also been filed in Missouri and Illinois state courts, while several cases are pending in the U.S. District Court, District of New Jersey. "Our Firm has heard from numerous Invokana patients since federal health regulators began investigating it and other SGLT2 inhibitor medications in May 2015, and those inquiries have only accelerated since the drugs' labels were updated with new ketoacidosis warnings in December. We are not surprised that the litigation involving Invokana is growing at such a rapid rate," says Sandy A. Liebhard, a partner at Bernstein Liebhard LLP, a nationwide law firm representing victims of defective drugs and medical devices. The Firm is investigating potential Invokana lawsuits on behalf of Type 2 diabetes patients who were diagnosed with ketoacidosis or kidney damage, allegedly due to their use of this or another SGLT2 inhibitor. Approved by the U.S. Food & Drug Administration (FDA) in March 2013, Invokana was the first SGLT2 inhibitor approved by the FDA to treat Type 2 diabetes. Other medications in this class include Invokamet, Jardiance, Farxiga, Xigduo XR and Glyxambi. In May 2015, the FDA disclosed that it was investigating the entire SGLT2 inhibitor class after the drugs were implicated in numerous reports of diabetic ketoacidosis, a disorder in which toxic acids called ketones accumulate in the blood stream. On December 4, 2015, the FDA announced that the "Warnings and Precautions" section on all SGLT2 inhibitors labels would include new information regarding a potential risk of ketoacidosis. The labels were also modified with information about life-threatening blood infections (urosepsis) and kidney infections (pyelonephritis) that originate as urinary tract infections. Diabetic ketoacidosis is a dangerous condition that can result in diabetic coma and death. The FDA recommends that patients stop taking their SGLT2 inhibitor and seek medical attention immediately if they develop any symptoms of ketoacidosis, including: nausea, vomiting, abdominal pain, tiredness, and trouble breathing. Bernstein Liebhard LLP is currently evaluating potential Invokana lawsuits on behalf of Type 2 diabetics who were diagnosed with ketoacidosis or kidney damage while using this drug or any other SGLT2 inhibitor. 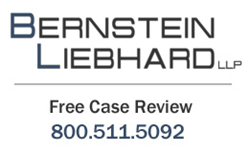 To learn more, please visit Bernstein Liebhard LLP's website, or call the Firm directly at 800-511-5092.